Busy, busy, busy… that sums up my life, and probably yours, so we need to make the most of the few hours we get in the great outdoors. 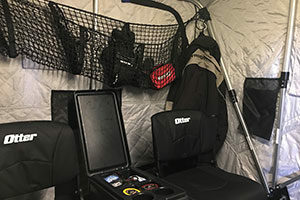 Meanwhile, ice fishing gear has become complex with specific items designed to keep us more comfortable and organized. Hats, gloves, bibs, coat, sonar, camera, rods, tackle, shelter, heater, auger… the list goes on. 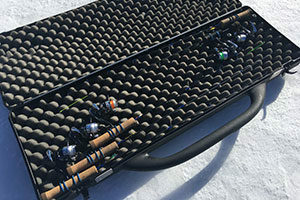 Keep your ice fishing gear organized to take advantage of those precious minutes out-of-doors. For starters, have a specific place for your gear and store it properly after using. Ice parkas and bibs have convenient pockets keeping essential gear within easy reach. In my pockets, you’ll find everything from hand warmers, ice picks, bait pucks, gloves, hook removal tools, a measuring device, a head lamp, small tackle boxes, and more. ready to go when I need them. Hard-sided rod boxes are great for protecting your rods and keeping lines tangle-free and ready to deploy. me no matter where I fish. I bring a storage compartment that contains most of my gear whether I’m fishing in a flip-over shelter, hub shelter, or wheelhouse. 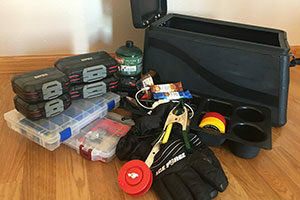 It contains tackle boxes, plastics, a pair of gloves, spare battery, a propane tank, hook removal tools, bait pucks, extra line, snacks and more. By keeping so much gear in one convenient package, I can grab my gear and leave confident that I haven’t forgotten anything. of the tub of your shelter. There are many ways to organize your portable shelters. I have added cargo netting and coat hooks to the back of my flip-over shelter to store hats, gloves, and coats. They stay dry and within arm’s reach while I’m fishing in comfort. When loading your vehicle, develop a routine and have a specific spot for your gear. This also reassures you that you’ve left nothing behind when traveling to or from the lake. Keeping everything organized also makes it much easier to setup and commence fishing in frigid temps. The reward? More quality fishing and less time and money spent locating or replacing lost, costly gear. Good luck! Get out there and catch some fish!